Remember the famous painting “A Sunday Afternoon on the Island of La Grande Jatte” by Georges Seurat? … What do you mean, “No”? Really? How about this … Remember the pointillism painting from Ferris Bueller’s Day Off? Ah, now we’re on the same page. 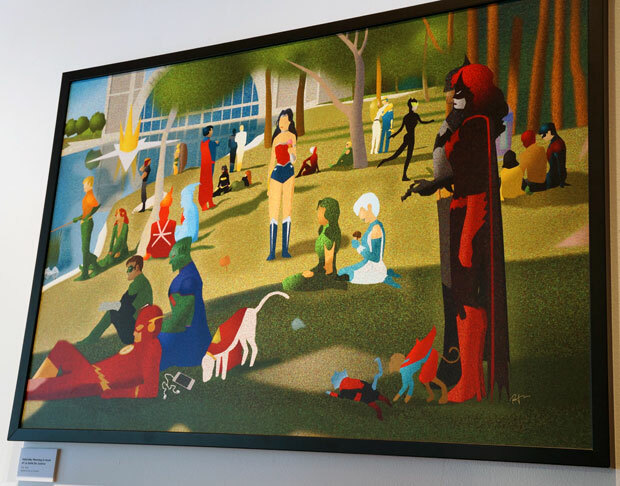 Below you’ll find Rey Taira’s super-cool digital print on canvas featuring numerous DC superheroes in their New 52 stylings. He titled the painting, “Saturday Morning in Front of La Salle De Justice.” Check out Ronnie Raymond (Firestorm Protocol version) chatting with Captain Atom! Sweet! Click the image to enlarge; we’re talking crazy-big size! This painting is featured in the Darkness & Light exhibition currently touring the United States as part of DC Entertainment’s We Can Be Heroes initiative to combat hunger in the Horn of Africa. Check out their website and do what you can to help. Taira also did a companion piece featuring DC supervillains as counterparts to the heroes entitled, “Sunday Evening by the Legion of Doom.” It’s a fun piece, but he used Captain Cold as Firestorm’s opposite. Weird. You can see this companion piece over on Comic Vine. I became aware of this fantastic piece over on Diabolu Frank’s Martian Manhunter blog, The Idol-Head of Diabolu. Be sure to check it out! Thanks, Frank! Posted in: Firestorm #09: New 52 v1 (Firestorm Protocols), Ronnie Raymond, Sketch/Art. Aside from putting Sondheim in my head, the great thing about this is that the pointilist style works the same way as the four-color printing process: tiny little dots of color that, when you stand back, combine to form other colors. Perfect choice. I love this. I would definitely hang this in my office if I could find an inexpensive, framed version. Some odd choices were made, but it still gives me grins. It’s been two full months since the last Who’s Who broadcast. In case you forgot. Bastards. Dexstar with Bippo the SuperMonkey….I would love to know the thought process of putting those two together… but the painting is Awesome and I would love a framed print. @Kelson – Great comparison between pointillism and comic books! @Ed – Totally agree. Would be cool to have the superhero and supervillain together. @Frank – Love you too. How’s your podcast coming? Blogs are like HPV. So many people have got that bug, it isn’t such a big deal. Podcasting is more like priapism, which sounds good in theory, is very painful in reality, and we all want to hear about it. So, as I was saying, how’s W’sWIII… er… coming? Hi..where is this show? Do we know if they are selling prints? is this for sale anywhere?